Given the recent availability of novel biologic agents for the treatment of rheumatoid arthritis (RA), the Hong Kong Society of Rheumatology has developed consensus recommendations on the management of RA, which aim at providing guidance to local physicians on appropriate, literature-based management of this condition, specifically on the indications and monitoring of the biologic disease-modifying anti-rheumatic drugs (DMARDs). The recommendations were developed using the European League Against Rheumatism (EULAR) recommendations for the management of early arthritis as a guide, along with local expert opinion. As significant joint damage occurs early in the course of RA, initiating therapy early is key to minimizing further damage and disability. Patients with serious disease or poor prognosis should receive early, aggressive therapy. Because of its good efficacy and safety profile, methotrexate is considered the standard first-line DMARD for most treatment-naïve RA patients. Patients with a suboptimal response to methotrexate monotherapy should receive step-up (combination) therapy with either the synthetic or biologic DMARDs. In recent years, combinations of methotrexate with tocilizumab, abatacept, or rituximab have emerged as effective therapies in patients who are unresponsive to traditional DMARDs or the anti-tumor necrosis factor (TNF)-α agents. As biologic agents can increase the risk of infections such as tuberculosis and reactivation of viral hepatitis, screening for the presence of latent tuberculosis and chronic viral hepatitis carrier state is recommended before initiating therapy. Rheumatoid arthritis (RA) is a chronic, autoimmune, systemic, inflammatory disease mainly affecting the joints characterized by pain, swelling, and stiffness, resulting in progressive joint destruction, deformity, and loss of function. In addition to articular symptoms, other organ systems may also be involved. RA affects approximately 0.5% to 1% of the adult population in the developed world . It is less prevalent in mainland China and in Hong Kong, with a reported prevalence of 0.37% and 0.35%, respectively [2, 3]. Although the etiology of RA remains largely unknown, both genetic and nongenetic causes have been implicated. Inflammation is initially localized in the synovial lining where there is synovial cell proliferation (pannus formation) and infiltration by inflammatory cells. The pannus invades and destroys cartilage and bone, leading to irreversible joint destruction and deformity . Erosions of the feet joints on extremity magnetic resonance imaging (MRI) are found in up to 91% of patients early in the course of the disease . Therefore, early diagnosis and treatment are crucial for preventing further joint damage. Currently, the classification of RA is based on the 1987 American College of Rheumatology (ACR) clinical classification criteria using history, physical examination, and laboratory and radiographic findings ; this set of criteria has been criticized for lack of sensitivity in early disease. A new set of joint ACR-European League Against Rheumatism (EULAR) criteria for RA classification has recently been published . The goals of treatment of RA are to alleviate symptoms, slow or stop disease progression, and reduce disability. The current RA treatment armamentarium comprises both synthetic and biologic disease-modifying anti-rheumatic drugs (DMARDs). In 2005, the Hong Kong Society of Rheumatology (HKSR) published consensus recommendations on the use of anti-tumor necrosis factor (TNF)-α agents in the treatment of RA, ankylosing spondylitis, and psoriatic arthritis . However, consensus recommendations on overall RA management had yet to be developed. Given the availability of newer biologic agents for RA treatment, the HKSR initiated the development of these consensus recommendations, which are aimed at providing guidance to Hong Kong physicians on appropriate, literature-based management of this condition, specifically on the indications and monitoring of the novel biologic DMARDs. The consensus recommendations were developed using the EULAR recommendations for the management of early arthritis  as a guide, along with local expert opinion. Clinical evidence supporting these recommendations were categorized as to level of evidence based on the classification system in Table 1. Early RA treatment improves the rate of clinical response and ultimate outcome. Early, aggressive therapy is required for patients with serious disease and/or poor prognostic factors. Treatment must be individualized, based on physicians' and patients' preference, and medical contraindications, among others. Evidence from published clinical trials shows better outcomes in early arthritis when treatment is initiated early; considerably more radiographic damage occurs when therapy is delayed (category A) [9, 10, 11]. In patients with more severe disease, it is important to achieve and maintain low disease activity as early as possible to prevent structural damage, thus necessitating a more intense treatment approach. Clinical trial data show that initial intensive treatment produces better outcomes than monotherapy in early arthritis (category A) [9, 12, 13, 14]. However, it is important to bear in mind that, given the variety of available treatments and the heterogeneity of patients, the management strategy should ultimately be tailored to the individual patient, taking into account factors such as individual preferences, contraindications, and side effects. Anti-cyclic citrullinated peptide (anti-CCP) antibody testing, ultrasound, and MRI may be utilized in the early diagnosis of RA. These tests are not recommended as routine tests but should be used for specific indications only. Anti-CCP testing may help establish an early diagnosis in patients who do not fulfill the 1987 ACR criteria, or for atypical cases. The anti-CCP antibodies have been shown to be more specific than the rheumatoid factor (RF) for diagnosing RA and possibly better predict radiographic progression of joint erosion (category C) ; anti-CCP testing has been incorporated into the new EULAR classification criteria to enhance its specificity for early disease . Ultrasound and MRI are suitable for early diagnosis of bony erosions in patients who do not fulfill the 1987 ACR criteria, or as a guide for joint aspiration and injection in difficult cases. Both these imaging techniques are more sensitive than radiography for detecting cartilage and bone abnormalities and can even identify earlier stages of the disease (category B) [16, 17]. 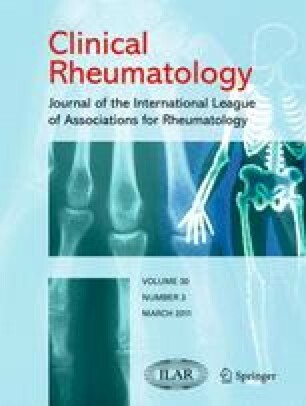 However, despite their benefits in early diagnosis of RA, these imaging techniques and testing for anti-CCP antibodies are significantly more costly and, therefore, should not be used routinely for every patient who presents with joint symptoms. Disease Activity Score using 28 joint counts (DAS28) should be utilized in the assessment of RA disease activity. Clinicians should try to compute the DAS28 at regular intervals, preferably during each clinic visit. The DAS28 is a useful instrument in clinical practice for objectively evaluating disease progression and response to therapy (category B) . It includes four variables: (1) number of tender joints from among 28 joints, (2) number of swollen joints from among 28 joints, (3) erythrocyte sedimentation rate (ESR), and (4) patient's assessment of general health status. C-reactive protein (CRP) may be used as an alternative to ESR in the calculation of the DAS28 score, using predetermined formulas (category B) . The DAS28 score ranges from 0 to 9.4 and can be used to readily classify disease activity levels into high, moderate, low, and remission. Factors indicating an unfavorable prognosis of RA include chronic smoking, high titres of anti-CCP or RF, radiologic erosion at onset, positive family history, HDA, severe functional limitation, and extra-articular manifestations (e.g., rheumatoid nodules). Several prognostic factors have been linked with a worse outcome in RA. Numerous reports exist of a relationship between smoking and increased severity of RA (category C) [20, 21]. The presence of anti-CCP antibodies is a strong predictor of radiological damage and progression (category C) . In addition, HDA at baseline , RF , radiologic damage at disease onset , and presence of extra-articular manifestations  are also predictors of poor outcome (category C). The ACR 2008 recommendations further confirm these prognostic factors as commonly used clinically important predictors of poor RA outcome . Clinicians should regularly assess the extent of their patients' disability and functional capacity. Possible assessment tools include the Health Assessment Questionnaire (HAQ) and the Medical Outcomes Study short-form health survey (SF-36). Since improving disability, function, and health-related quality of life are important goals for patients, regular assessments of these should become an integral part of RA management. The commonly used assessment tools, the HAQ and SF-36, assess the impact of disease in terms of patient-centered outcomes . The HAQ, the most commonly used health status measure, primarily determines functional disability, while the SF-36 assesses limitations in physical activities, as well as emotional status of patients. The goal of treatment is disease remission (i.e., DAS28 < 2.6), regardless of whether the patient has early or established RA. It should be emphasized that treatment of early RA results in better response rates and a higher probability of drug-free remission. Since there is no cure for RA, remission has become the accepted treatment goal to arrest joint damage and reduce the likelihood of long-term disability (category B) [9, 11]. Clinical trials of both early [12, 13, 14] and established  RA have demonstrated better remission rates and radiographic progression with early intensive treatment than monotherapy or routine care (category A). Treatment with synthetic DMARDs should be initiated as soon as possible after a diagnosis of RA is made. DMARD-naïve patients should be started on methotrexate monotherapy. Methotrexate should be given for a duration of no less than 3 months at the maximally tolerated dose. Patients without poor prognostic factors (i.e., with no erosions, are RF-negative, with low CRP levels, or with low disease activity) or those who cannot tolerate methotrexate may receive other DMARDs, such as leflunomide, sulfasalazine, hydroxychloroquine, or injectable gold. Corticosteroids, given orally, intramuscularly, or intra-articularly, may be used as bridging therapy as appropriate. A combination of DMARDs, or methotrexate combined with an anti-TNF-α agent, may be considered in patients with very serious disease and poor prognostic factors. However, the cost-effectiveness of the latter approach has yet to be determined. Several clinical trials have clearly established the short- and long-term efficacy and the relatively beneficial safety profile of methotrexate in RA (category A) [9, 29, 30]. Methotrexate is considered the “anchor drug,” and there is widespread acceptance for its use as initial therapy in most RA patients (category A) [9, 31, 32]. Alternative first-line treatments include sulfasalazine, which shows similar efficacy to methotrexate, and hydroxychloroquine, which has very good tolerability among the DMARDs (category B) [11, 26, 33]. Combination treatment with two or more DMARDs, or of methotrexate and an anti-TNF-α agent, has been shown to confer greater efficacy than monotherapy and, thus, is appropriate for patients with serious disease or poor prognostic factors (category A) [9, 12, 13, 34, 35, 36]. However, the cost-effectiveness of first-line intervention with biologic agents in treatment-naïve patients remains uncertain (category C) . Suboptimal treatment response is defined as failure to achieve remission (i.e., DAS28 < 2.6) after 3 months of methotrexate at a dose of at least 15 mg/week. Such patients (i.e., DAS28 ≥ 2.6 despite methotrexate) should receive step-up therapy, i.e., combination therapy of methotrexate plus another agent: methotrexate plus leflunomide, methotrexate plus sulfasalazine plus hydroxychloroquine, or methotrexate plus a biologic agent. For patients who continue to present with active disease despite methotrexate, addition of another conventional DMARD or biologic agent should be considered (category A) [9, 11, 26]. In one randomized, placebo-controlled trial, the addition of leflunomide to existing methotrexate therapy resulted in significant clinical benefit in patients with persistently active RA (category A) ; however, given the recent FDA report of fulminant hepatitis in leflunomide users, meticulous monitoring of liver function is warranted in patients administered this drug . In another randomized trial, combination therapy with methotrexate, sulfasalazine, and hydroxychloroquine resulted in better remission rates than single treatment in early RA (category A) . Similarly, other randomized controlled trials have demonstrated better clinical efficacy when TNF-α inhibitors (etanercept, adalimumab, and infliximab) were given concomitant with methotrexate, following inadequate response to methotrexate alone (category A) [41, 42, 43]. The ACR 2008 recommendations suggest a variety of dual and triple drug combinations, incorporating methotrexate, depending on the patient's level of disease activity, disease duration, and prognostic features (category B) . Patients who require methotrexate plus a biologic agent may be administered any one of the following combinations: methotrexate plus an anti-TNF-α agent, methotrexate plus tocilizumab, methotrexate plus abatacept, or methotrexate plus rituximab. The choice of biologic will depend on various factors, including patient's and physician's preferences, availability of funding, and medical history. The value of the combination of methotrexate and anti-TNF-α agents in improving radiographic, clinical, and functional outcomes is well established (category A) [12, 13, 36, 41, 42, 43]. In recent years, several novel biologic drugs with different mechanisms of action have emerged as potential additions to rheumatologic pharmacotherapy. These include the interleukin (IL)-6 inhibitor tocilizumab, the selective T-cell co-stimulation modulator abatacept, and the chimeric, anti-CD20 monoclonal antibody rituximab. Several recent randomized, double-blind, placebo-controlled trials have demonstrated superior therapeutic efficacy when each of these agents was co-administered with methotrexate in RA patients [44, 45, 46, 47, 48, 49, 50, 51]. Trials involving tocilizumab have shown decreased disease activity and better remission rates (category A) [44, 45, 46]. One trial showed tocilizumab monotherapy to be superior to methotrexate monotherapy in DMARD/methotrexate-naïve patients (category A) ; another demonstrated that tocilizumab with methotrexate delayed radiographic progression of structural joint damage significantly more than methotrexate alone in patients who respond inadequately to methotrexate (category A) . A clinical trial using abatacept demonstrated improvements in arthritis signs and symptoms, physical function, and quality of life at 1 year , and inhibition of radiological progression for up to 2 years (category A) . Another clinical trial of rituximab showed improvements in disease activity, fatigue, disability, and health-related quality of life (category A) . Anti-TNFα failure patients (failure of DAS28 to improve by 1.2 or <5.1 over 16 weeks) may be administered any one of the following: another anti-TNF-α agent, tocilizumab, abatacept, or rituximab. There is less evidence to support the efficacy of rituximab in seronegative RA patients. Despite their efficacy in RA, anti-TNF-α agents elicit an inadequate response in a substantial number of patients. In such patients, alternative biologic agents are recommended. Evidence shows that patients who are refractory to anti-TNF-α therapy gain significant clinical and functional benefits from tocilizumab , rituximab , or abatacept (category A) . However, rituximab may not be equally efficacious in all RA patients. A recent pooled analysis of two-phase III rituximab trials has shown that patients who are seropositive (anti-RF and anti-CCP positive) are significantly more likely to achieve a clinical response than those who are seronegative (category A) . These findings suggest that the serological status of patients should be taken into consideration when choosing these biologic agents. Prior to using a biologic agent, the clinician should screen the patient for both active and latent tuberculosis infection. Patients with active tuberculosis should be adequately treated with the standard regimen before reconsideration of biologic treatment. Patients who screen positive for latent tuberculosis infection (i.e., with a positive purified protein derivative (PPD) test, defined as an induration of ≥10 mm in diameter) should be given isoniazid treatment for 9 months. If the indication for biologic use is not urgent, isoniazid should be given for 4 weeks, to assess tolerability, before administration of the biologic agent. For patients who test PPD-negative, there is insufficient evidence to recommend annual retesting unless there is recent exposure to tuberculosis or the risk of transmission is high. Numerous reports indicate an increased risk of developing active tuberculosis soon after initiating anti-TNF-α agents (category A) . Furthermore, in patients with a past history of tuberculosis, abatacept treatment may reactivate the infection as it is known to compromise T-cell immunity. This has led to the recommendation for routine screening for active and latent tuberculosis infection whenever treatment with these biologic agents is considered (category D) [54, 55]. While an induration of ≥10 mm in diameter has been determined to be appropriate to signify a positive PPD test for patients with RA, a lower cut-off of ≥5 mm has been utilized to define latent tuberculosis in patients who are significantly immunocompromised, such as those with human immunodeficiency virus (HIV) infection or who are transplant recipients (category D) . Patients with evidence of latent tuberculosis infection should receive prophylactic tuberculosis treatment with isoniazid for 9 months before commencing biologic agents (category B) [54, 55]. Rifampicin as monotherapy for 4 months is recommended for patients resistant to, or intolerant of, isoniazid, or for whom isoniazid is contraindicated (category D) . In addition, the hepatitis B and C status of patients should be screened. Chronic carriage of hepatitis B and C virus (HBV and HCV, respectively) is a relative contraindication for the use of anti-TNF-α agents. Active hepatitis has to be excluded and baseline HBV DNA or HCV RNA levels should be checked for chronic carriers of HBV and HCV. Appropriate antiviral therapy, as determined by the co-managing hepatologist, is indicated. Patients should be warned of the risk of fulminant hepatitis reactivation. Rituximab is contraindicated in chronic hepatitis B or C carriers. There is little information regarding the safety of tocilizumab and abatacept in chronic viral hepatitis carriers. Another important safety consideration when making therapeutic decisions with biologics is hepatitis B and C status. The anti-TNF-α agents are relatively contraindicated in carriers of HBV and HCV because of reports of viral reactivation, which can lead to serious complications (category B) [26, 56, 57]. If there are no alternatives, patients should be warned of the risk of serious hepatitis reactivation prior to administration of an anti-TNF-α agent. In clinical trials of hemic malignancies, rituximab has been shown to reactivate occult hepatitis B (i.e., HBsAg-negative but anti-HBc-IgG-positive) [58, 59]; it is, therefore, contraindicated in chronic hepatitis B carriers and in patients with past hepatitis B infection. Hence, all candidate patients for these drugs should be screened for HBV and HCV infections before commencing treatment. In particular, the status of both HBsAg and anti-HBc-IgG should be determined before rituximab treatment. There is insufficient information on the safety of tocilizumab and abatacept in chronic viral hepatitis carriers. History of solid tumor is not a contraindication for use of anti-TNF-α agents if there is no recurrence in the past 5 years. Anti-TNF-α agents should be avoided in patients with a history of lymphoproliferative disorders. Although etanercept has been associated with an increased incidence of solid malignancies in one clinical trial (category A) , anti-TNF-α therapy is generally not associated with an increased occurrence of solid tumors. According to a Swedish population-based study, the relative risks of solid cancers in anti-TNF-α treated patients were similar to those of other RA patients (category C) . Hence, anti-TNF-α agents are not contraindicated in patients with solid tumor history if there is no recurrence in the past 5 years. However, they should be avoided in patients with prior lymphoproliferative disorders because of significantly increased risk of lymphomas (category C) [26, 62]. Use of anti-TNF-α agents is contraindicated in patients with severe heart failure, demyelinating disorders, or lupus-like features. Treatment of moderate-to-severe heart failure patients with anti-TNF-α agents has been associated with either no clinical benefit  or worsening of heart failure outcomes  (category A). Furthermore, these agents are known to induce autoimmune diseases such as demyelinating disorders and lupus and, as such, should be avoided in patients with these underlying conditions (category B) [26, 65]. Live attenuated vaccines are not recommended for patients being treated with biologic agents. Killed vaccines (e.g., influenza vaccine, pneumococcal vaccine), if required, should be given prior to administration of biologic agent. Because the level of immune response to vaccinations may be impaired, live vaccines are contraindicated during biologic therapy (category D) . Alternatively, inactivated vaccines can be safely administered, typically at least 2 to 4 weeks, before initiating biologic therapy. Patients on biologic agents should be closely monitored for side effects. Patients should be very closely monitored for infective complications, including opportunistic infections. Patients should be monitored for symptoms of tuberculosis infection, both within and outside the respiratory system. Chest X-ray should be performed every 3 months during the first year of therapy and annually thereafter, or when the patient develops symptoms. Complete blood count, renal/liver function tests, lymphocyte count (for rituximab), and neutrophil count (for tocilizumab) should be regularly checked. Fasting lipid levels should be regularly surveyed (particularly for tocilizumab) and statins should be given whenever appropriate. Look out for new neurological symptoms in patients administered rituximab. Look out for gastrointestinal symptoms in patients administered tocilizumab, especially those with a history of diverticulitis or intestinal ulceration. Adverse events, especially serious adverse events, should be reported to the HKSR Biologics Registry. Registries and databases have reported an increased risk of serious bacterial infections with the use of biologic DMARDs (category A) [66, 67, 68]. In particular, the rates of pneumonia and serious skin and soft tissue infections are increased. Once biologic therapy is initiated, patients should, therefore, undergo regular safety assessments. Chest X-rays should be performed to detect possible reactivation of latent tuberculosis. Laboratory testing, including lymphocyte count for rituximab and neutrophil count for tocilizumab, are warranted as treatment with each of these agents is associated with rapid depletion of peripheral B-cells  and neutropenia [44, 45, 46, 69], respectively (category A). Treatment with biologic agents, particularly tocilizumab, can alter the serum lipid profile, resulting in increased low density lipoprotein (LDL), and total cholesterol levels (category B) . Hence, it is important to monitor lipid levels and administer statin therapy, when required. Tocilizumab administration has been associated with bowel perforation and subsequent peritonitis  and, therefore, should be closely monitored in patients with a history of diverticulitis or intestinal ulceration (category B). Testing of laboratory safety parameters should be performed regularly. Patients with RA should be screened for risk factors for cardiovascular (CV) disease and for osteoporosis. Once detected, these conditions should be managed as appropriate. RA patients are more prone to CV disease: the standardized incidence ratio of myocardial infarction and stroke is 1.5 to 1.7 times that of the incidence in the general population (category A) [71, 72, 73, 74]. This is attributable to an increased prevalence of traditional CV risk factors and persistent elevation of inflammatory cytokines in this population. Early identification, adequate management, and ongoing monitoring of risk factors are necessary to reduce this excess CV risk. The latest EULAR recommendations for CV risk management in patients with RA and other forms of inflammatory arthritis states that the first principle of management is to assess and control all components of total CV risk, which includes providing appropriate, evidenced-based advice with regard to smoking, physical activity, diet, weight, and blood pressure, as well as aggressive suppression of the inflammatory process to further lower risk (category D) . Similarly, RA patients are more likely to develop osteoporosis and fragility fractures (category A) . Appropriate screening, monitoring and therapy for osteoporosis is deemed mandatory. These recommendations by the HKSR summarize the latest evidence pertaining to RA management (Table 2), with a focus on the use of novel, biologic DMARDs. While methotrexate is still held up as the primary therapeutic option for most RA patients, new biologic agents currently available are recognized as effective and safe treatment modalities, particularly in patients with a suboptimal response to traditional DMARDs. Given that most of these biologics have only very recently come into use, and that they been associated with the development of infective and other complications, these recommendations emphasize the importance of vigilant monitoring for side effects, notably serious bacterial and viral infections, in patients administered these agents. These recommendations will be reviewed periodically, in light of new published evidence and adverse event reports. As these recommendations evolve and gradually become more explicit, they will provide even more specific guidance to rheumatologists and other physicians who treat patients with RA, ultimately leading to improved clinical outcomes. The Hong Kong Society of Rheumatology would like to thank the following full members who were involved in the review of these consensus recommendations: Eric Yuk Tat Chan, Ka Ho Chan, Ka Man Chan, Ka Yan Helen Chan, Pui Shan Julia Chan, Yee Ki Chan, Shuk Yi Lucia Chau, Tak Cheong Cheung, Ho Yin Chung, Carmen Ho, Ling Yin Ho, Emily Kun, Lai Wa Kwok, Man Leung Kwok, Weng Ng Lao, Chak Sing Lau, Yu Lung Lau, Anthony Kai Yiu Lee, Ka Lai Lee, Kwok Fai, Tony Lee, Kwok Kei Lee, Man Yee Jolly Lee, Shui Shan Lee, Tsz Leung Lee, Tsz Yan, Samson Lee, Man Chi Leung, Moon Ho, Alexander Leung, Ying Ying Leung, Hor Ming Liu, Ming Chi Luk, Kai Yiu Ma, Lai Wo Mak, Mo Yin Mok, Kam Hung Daniel Ng, Woon Leung Ng, Chi Keung Sung, Ronald F. Tan, Shuk Kuen Sandy Tang, Chi Hung To, Hing Sum Tsui, John Chun Ming Wan, Man Choi Wan, Kong Chiu Wong, Shiu Man Jude Wong, Woon Sing Raymond Wong, Wai Shan Sandy Woo, Cheuk Wan Yim, Shirley King Yee Ying, Man Lung Yip, Ka Lung Carrel Yu, and Ka Yan Catherine Yuen. University Medical Centre Nijmegen. DAS-SCORE.NL. Home of the DAS. Available at: http://www.das-score.nl/www.das-score.nl/. Accessed 1 June 2010. US Food and Drug Administration (FDA) Web site. FDA Drug Safety Communication: New boxed warning for severe liver injury with arthritis drug Arava (leflunomide). Available at: http://www.fda.gov/Drugs/DrugSafety/PostmarketDrugSafetyInformationforPatientsandProviders/ucm218679.htm. Accessed 31 July 2010.